"We are CrowdFunding Guys / We are CrowdFunding Guys"
Before we begin our normal Broadcast, we would like to take a moment and offer our thoughts and prayers for those Families, Children and Teachers/Staff involved in the Newtown, Connecticut - Sandy Hook Elementary School shootings today. How: Tribbett and Baker met while interning at JPMorgan. The two men went on to work in finance, and found themselves asking 'What about small business?' “The system is just broken,” Tribbett said. “I was standing on the trading floor when huge companies couldn’t access capital. If they couldn’t, then how are the Main Street guys faring?” The two set out to create access to capital for businesses who need investments under $100,000. Bolstr works by leveraging the concept of garnering support from the community and word-of-mouth crowdsourcing to fund startups. 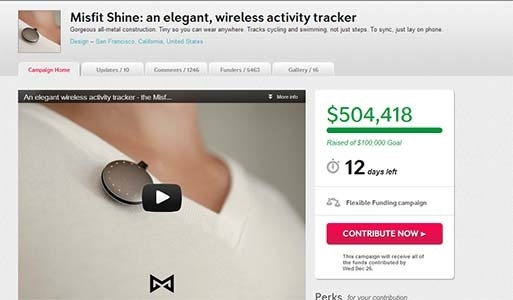 The company’s model was established before President Obama signed the JOBS Act and the idea of crowdfunding started to gain traction. A FINRA spokesperson said the FINRA Board of Governors just voted to authorize the organization to create a interim form for crowdfunding portals and it's unclear how long it will take for them to actually make the form available or start accepting applications. The Financial Industry Regulatory Authority (FINRA), the largest independent regulator for all securities firms doing business in the United States,last week decided to "issue an interim form to seek essential information from prospective funding portals intending to apply for membership with FINRA pursuant to the JOBS Act." This is one of the first steps required for crowdfunding to become a reality as envisioned under the Jumpstart Our Business Startups (JOBS) Act, signed into law by President Barack Obama on April 5. Companies that want to act as the middleman in the crowfunding process (Klein's company will be one of them), will have to register with FINRA and will be required to follow all of the rules the Securities and Exchange Commission comes up with. 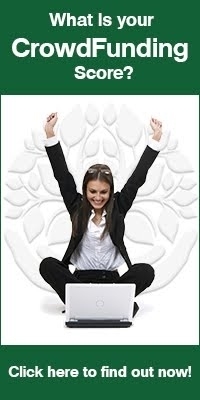 The most optimistic predictions have the changes under the JOBS Act taking effect sometime by the summer of 2013. Clean, reliable lighting is essential for development… and many parts of the world don’t have the basic infrastructure necessary to provide the kind of lighting we take for granted. Not any more – social entrepreneurs around the world have recognized the need for lighting in the world’s poorest regions, and responded with all sorts of ideas that don’t require an electric grid. This week, I came across two more with active crowdfunding campaigns… and, clearly, these concepts resonate with people, as neither has to worry about not meeting their funding goal. ...and continuing on the Green theme, we trun to a Domestic CrowdFunding Solar Project. This three-part series profiles some other startups that are paving the way to spread solar to all.....There's a huge opportunity here to mobilize people who care about renewable energy to take meaningful action that will help deliver renewables to more and more communities." RE-volv’s, A revolving fund that grows quickly, mission is to empower people and communities to invest collectively in renewable energy. RE-volv is currently crowdfunding for the final $10,000 needed to pay for their first solar project, thus launching the revolving fund. The campaign, which will run through January 20th, is being hosted on Indiegogo and can be accessed at www.solarseedfund.org. If you donate $25 now, over the 20-year lease period that turns into $100 that you’ve invested in solar.” RE-volv hopes to put solar on community centers that have a reach, in order to educate as many people as possible in the area about solar. In addition to nonprofits, Karelas is looking at coops that own their own space and serve as a community center -- and even condo complexes. The potential shows that the Private sector can determine viability and provide for the re-nuable enegry Industry to become self sustainable, therefore not rely on politically supported programs, since we in the USA have had several high profile Government funded failures in this area. Power, in a literal sense, to the true Entrepreneur!. From across the Pond, at Europe's Largest Tech Conference, LeWeb, help in Paris every December. From idealistic college students whose apps won start-up competitions a month earlier, to some of the world's most powerful investors, to founders and executives of household names like Google, WordPress, and Instagram .......you get your finger on the pulse of the tech scene and see where it's going before anybody on the outside even has an inkling. Equity CrowdFunding, as allowed in Europe and soon to be available in the USA, is not only for tech or Web-based companies! This change could be huge for small businesses of every stripe, since it's so hard to get something going without a chunk of cash up front, and it's really hard to find that chunk of cash from the traditional institutions. Europe's, FundedByMe does have an interesting fail-safe mechanism built in to their funding process that is designed to protect both the investors and the entrepreneurs. Entrepreneurs who want to raise funds have to go through a "pre-round" phase to get feedback from the crowd and see what kind of interest they can generate in their project. If they're not ready for prime time, they find out soon enough. This pre-Stage is a great validation step to then ensure the Business idea is real and something every effort needs to do, as they "refine" and tune their efforts.....more on this process in the future & @ CFP. Issuer: Middlewest Portal: Kickstarter Pitch: Middlewest is a food magazine in the form of modern recipe cards. 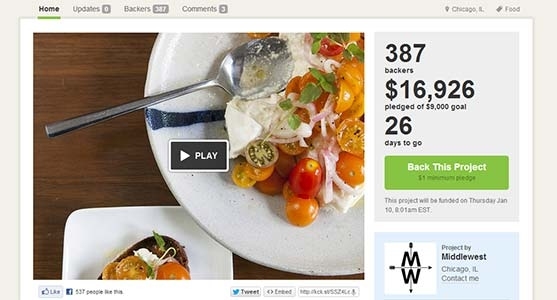 URL: http://www.kickstarter.com/projects/557106738/middlewest-a-new-food-magazine-from-chicago Attempting to raise: $9,000 Funded amount: $16,908 Days left: 26 Campaign Video: Very good story and scripts. Reward QTY and Quality: 12 $1 - $750 Review: Middlewest is a semiannual food and recipe magazine. But it doesn't look quite like other magazines. The pages are unbound, and it's printed on thick cardstock; each page acts as its own recipe card. So you can think of Middlewest as a cooking magazine, or you can think of it as a set of recipe cards. Either way, the look and feel of Middlewest is progressive, new and, in our opinion, gorgeous. Issuer: Leyla McCalla Portal: Kickstarter Pitch: Vari-Colored Songs is an album of songs written to Langston Hughes' poetry, Haitian folk songs and original compositions. URL: http://www.kickstarter.com/projects/1315256600/vari-colored-son... Attempting to raise: $5,000 Funded amount: $18,813 Days left: 20 Campaign Video: Very natural , nice music and quick ask. Reward QTY and Quality: 10 - $1.00 and $1000 (private concert in you house?) Review: Thanks to you all, in just one week I have met my kickstarter goal! These funds ensure that all of the base production costs of this album will be covered! What a relief! But also a great honor to be able to hire and work with all of the amazing people involved in making this album!!! As I look further into how to get the music out to the world, I realize that promotional costs are potentially exponential. Seems there are two routes to getting your music out there beyond your immediate community (social networks, friends and family). One route is to hire a publicist, which costs at minimum about $2500 a month (eeeeeeeeek!). The second route is a bit more ninja style: order an extra however many copies of your album to give to radio stations and other media outlets so that people that have never heard of you, know about you. 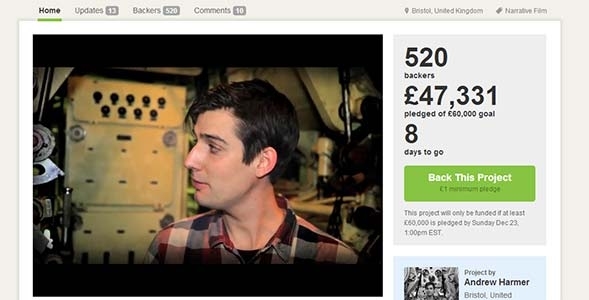 Issuer: Andrew Harmer Portal: Kickstarter Pitch: The Fitzroy – A live action, black comedy feature film set in an alternative post-apocalyptic 1950s on a submarine hotel. URL: http://www.kickstarter.com/projects/1538713376/the-fitzroy Attempting to raise: $97,176.00 (£60,000) Funded amount: $76,660 (£47,331) Days left: i Campaign Video: Very good , professional - Lots of asks - Camera people have the advantage. Reward QTY and Quality: N/A Review: The Fitzroy is an independent, live action, feature film; a black comedy set in a post-apocalyptic 1950’s Margate. The world is covered in a poisonous gas and the Fitzroy Hotel (a beached submarine) is the last place for a traditional holiday. The hotel is sent into chaos when one of the guests murders the hotel’s owner. It is left to Bernard, The Fitzroy’s hapless bellboy, to keep the hotel from falling apart as he struggles to hide the murders from the other guests and the ever-suspicious authorities. 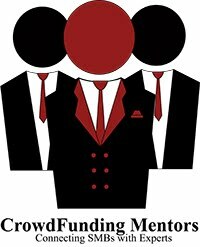 Again, in an effort to help the Innovator understand how important some basic steps in building your CrowdFunding campaign are, and the fundamental value of CrowdFunding Planning, we see here from MedCityNews.com the ....... Twitter chat among crowdfunders last week made it clear that that a well-suited crowdfunding project must have a few critical elements: Emotional appeal, a trustworthy founder and a compelling story. Character development -they want to know who’s getting their money, and they want to trust that those people will deal with it responsibly. Physical description - to fund a consumer product, a video is the perfect opportunity to show people why they want to buy it...What features will they look at? What makes it different from what’s next to it on the shelf? Explain future implications - telling the potential funder how his or her money is going to be used in furthering that project. Context — the all important ’why’ - ...Consider who’s going to be watching the video and why they might be compelled to contribute, being transparent about your motives is paramount! “The safest way to try to get what you want is to try to deserve what you want. In honor of the Hostess Bakery business re-structuring CrowdFunding effort, Keep calling the WhiteHouse, the Senate & Congressonal representatives to Motivate the SEC to get the rules written and released! Again: From all the Staff @ CrowdFunding Daily News, our heartfelt thoughts & prayers for the families involved in the Sandy Hook Elementary School events today. 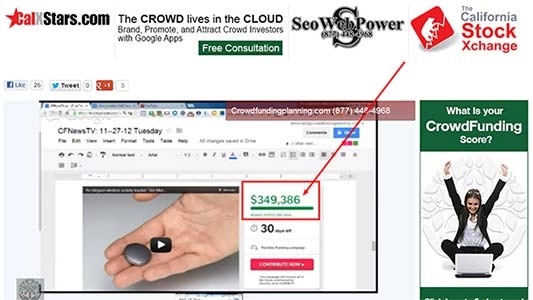 NOW , Go CrowdFund with Passion, a Plan and the leverage the Power!